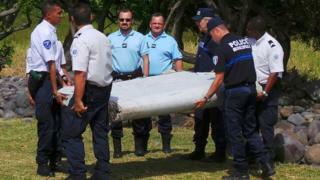 French prosecutors have said they believe "with certainty" that a wing part found on Reunion Island in July came from missing flight MH370. The Malaysia Airlines plane carrying 239 people veered off its course from Kuala Lumpur to Beijing in March 2014. But on Thursday they said a technician from Airbus Defense and Space (ADS-SAU) in Spain, which had made the part for Boeing, had formally identified one of three numbers found on the flaperon as being the same as the serial number on MH370. The magistrate charged with conducting the investigation and an aviation expert had gone to ADS-SAU headquarters on Thursday. The families of those aboard - who were mostly Chinese - have been angered by the apparent discrepancies in statements by French and Malaysian officials, and have accused the authorities of hiding the truth. Prime Minister Tony Abbott has said that the search would continue as "we owe it to the hundreds of millions of people who use our skies".